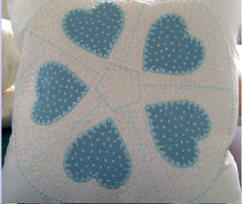 I used one of my heart applique designs for this cushion. Stippled inside the circle using my new Janome 6500P and used a fancy stitch for the border lines and circle. 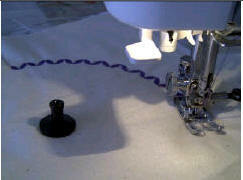 I also used the Janome circular tool when doing the fancy circle. 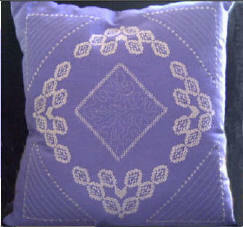 I used one of my xstitch design for this cushion. Stippled inside the square using my new Janome 6500P and used a fancy stitch for the border lines and square. 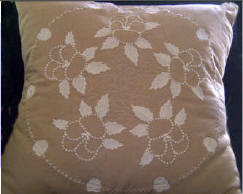 I used my candlewick pansy design for this cushion. Stippled inside the circle using my new Janome 6500P and the circular tool. I used a fancy stitch for the circle lines and a small pansy design. 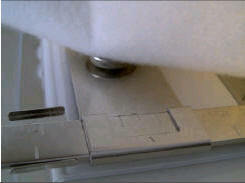 The Circular tool for the 6500P is available from Janome Dealers. 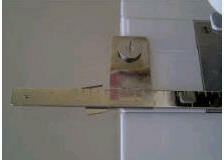 You remove the bobbin cover and place the circular tool in its place. 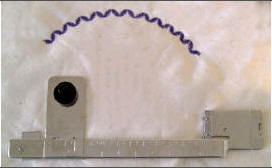 The fabric is placed over the spike and held in place with the black cap. 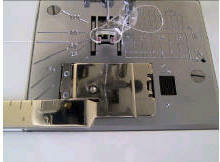 Select the stitch you want to sew and let the machine feed the fabric as per normal.